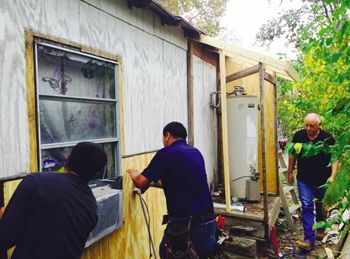 EAST ALDINE – A project to rehabilitate and repair a delapidated house in the district got off to a slow start last week, as weather caused the district to postpone the full effort of a volunteer force to fix up the house at 4715 Mierianne Street. The district project is called “project HOPE” and calls on everyone to volunteer with their repair skills. East Aldine District is partnering with Rebuilding Together Houston to accomplish this rebuilding effort. Rebuilding Houston is Houston’s largest community outreach organization working to preserve affordable homeownership and revitalize neighborhoods by providing home repair and renovation services at no cost to low-income homeowners in need, such as the elderly, individuals with disabilities, veterans, and people impacted by natural causes. East Aldine director of services Richard Cantu said that a full group of volunteers were scheduled for Saturday’s work effort, and now will reschedule for next Saturday if weather permits. He thanks BMS Construction, owner Ben Hernandez and his two sons for their work on the siding and trim last Thursday and Friday. BMS was asked to help by NCI’s Jose Rivera, through his agency’s network of volunteer organizations.